On a cold February morning, we have a spot of hope looking forward to the opening of the Fort Wayne Children&apos;s Zoo in April. To help you look forward to these warm sunny days, an update on how some of our favorite Fort Wayne residents are spending their winters: Kaasidy, the black and white colobus monkey born at the Fort Wayne Children&apos;s Zoo on September 25, is growing by leaps and bounds - literally! "On Christmas Day, we saw her leaping from branch to branch for the first time," says zoo keeper Erin Fairchild. "Before that, she relied on Mom to help her out. She&apos;s very confident already!" Kaasidy, her mother Jibini, and her father Finnigan are keeping warm in their indoor quarters for the winter. Native to Africa&apos;s equatorial forests, they prefer summer sunshine to snowy winter days. 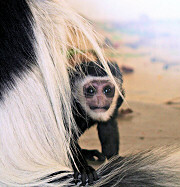 Born completely covered in white fur, black and white colobus infants obtain the deep black coat, shaggy white mantle, and tufted white tail typical of adult colobus monkeys when they are 3-4 months old. Kaasidy is already well on her way to developing her adult coat. 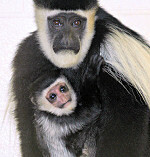 Kaasidy is the first colobus baby to be born at the zoo in 12 years. In the wild, some populations of colobus monkeys are threatened by hunting for their dramatic black-and-white coats and by habitat loss. 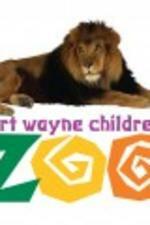 Meet Kaasidy and all of her zoo friends this summer at the Fort Wayne Children&apos;s Zoo!